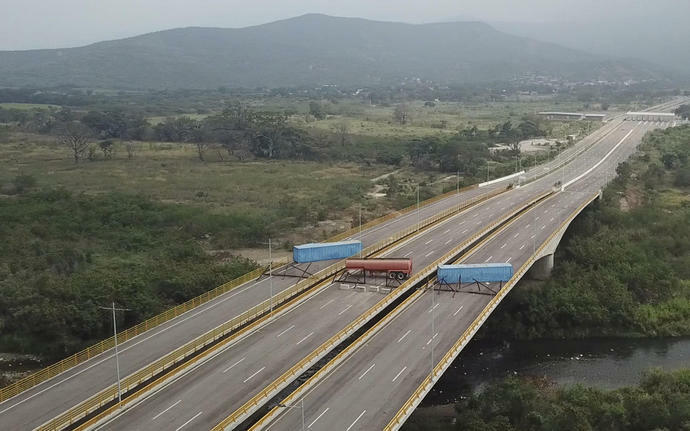 CUCUTA, Colombia (AP) -- The Venezuelan military barricaded a bridge at a key border crossing with Colombia, issuing a challenge Wednesday to a U.S.-backed effort by the opposition to bring humanitarian aid into a nation plagued by shortages of food and medicine. The aid squabble is the latest front in the battle between Guaido and President Nicolas Maduro, who is vowing not to let the supplies enter the country. Maduro argues Venezuela isn't a nation of "beggars" and has long rejected receiving humanitarian assistance, equating it to a foreign intervention. Venezuelan Jose Mendoza stood at the entrance to the Colombian side of the bridge holding a sign that said: "Humanitarian aid now." Mendoza, 22, said he is tired of seeing Venezuelans suffer from food and medical shortages and that the military should stand on the side suffering Venezuelans. "They have to be by the side of the people and support us," Mendoza said. "They have family members who are dying of hunger. The call is for them too." Roughly 40 countries around the world have backed Guaido, who swore himself in as president in late January contending that as head of the opposition-led National Assembly he is Venezuela's rightful leader because Maduro's re-election last year was a sham. Guaido says the emergency shipment is a "test" for Venezuela's armed forces, which will have to choose if they allow the much needed aid to pass, or if they instead obey orders. No details have been released on exactly how the opposition plans to get the shipments into Venezuela. "The revolution is more alive than ever," Maduro said. "We're advancing in the development of health care for the good of the people." "Venezuela's military under Maduro's orders is blocking aid," Pompeo tweeted. "The Maduro regime must LET THE AID REACH THE STARVING PEOPLE." Guaido on Wednesday accused Maduro's government of rejecting the assistance because officials often handed out imported food and medicine in exchange for bribes. Speaking to farmers, Guaido said the transitional government he's mounting to replace Maduro is taking steps to make Venezuela self-reliant. "We don't want to depend more on a food subsidies than is necessary today," he said, calling the blockade an "absurd reaction from a government that doesn't have the interest and well-being of Venezuelans" in mind. Maduro has clung to power with the support of Venezuela's highest-ranking military officers. He dismisses Guaido as a puppet of the United States, which he says is seeking to colonize Venezuela and exploit its vast oil resources. "We condemn the brutality of the Maduro regime, whose socialist policies have turned that nation from being the wealthiest in South America into a state of abject poverty and despair," Trump said. In a trip to Washington on Wednesday, Colombian Foreign Minister Carlos Holmes Trujillo said that any attempt to block aid from entering Venezuela is tantamount to "a crime." "Committing such a crime would give even more reason for the unified countries to ask the International Criminal Court to investigate Maduro," Trujillo told reporters after a meeting with the head of the Organization of American States, Luis Almagro. "It's a means of intimidation," said Pereira, director of the nonprofit Entre Dos Tierras, which aids Venezuelans migrants. "But I don't think it will accomplish anything." Associated Press writers Jorge Rueda in Caracas, Venezuela, and Luis Alonso Lugo in Washington contributed to this report.